Hello, Ribbon Lovers! 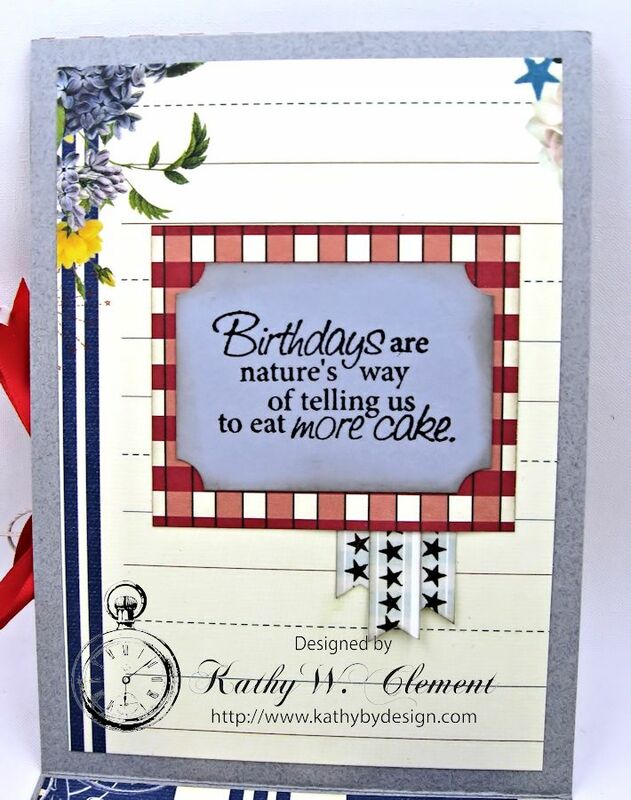 It's Kathy here with a great summer birthday card idea for the lighthouse lover near you. I can almost feel the salt spray on my face and hear the crashing waves on the shore. I used Webster's Pages Yacht Club papers to make this card. It's an oldie but a goodie from my stash. 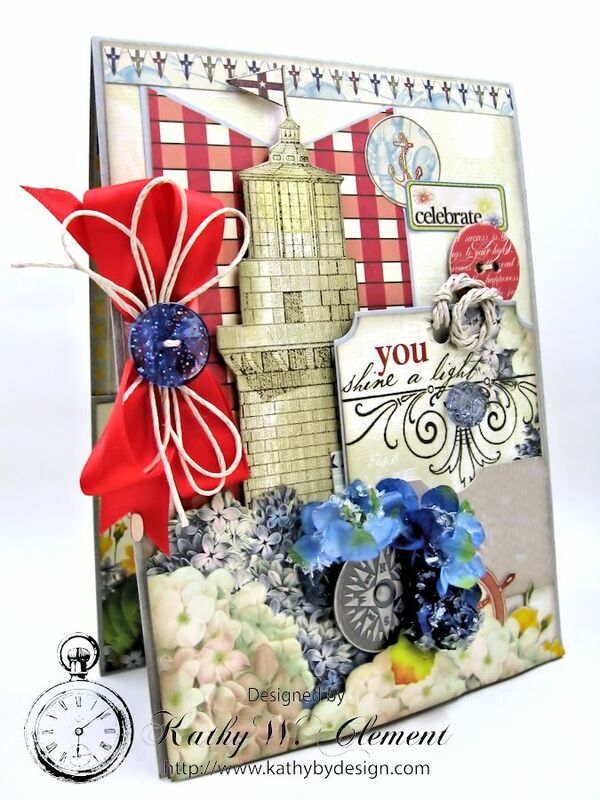 I fussy cut the lighthouse, flowers and ship's wheel from the paper collection, inked all the edges and then layered them with foam dots to create lots of dimension. There was so much grey in the color palette that I wanted to punch things up with my ribbon choice. I turned to the May Ribbon Club Assortment and found that the Poppy Red Double Faced Satin was just the right ribbon for the job! 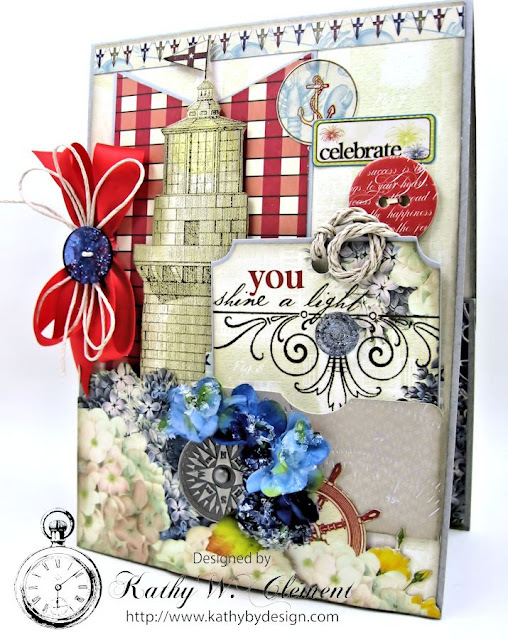 The silky texture and bold color really pumped up the volume of this nautical card. I topped it with a hemp string bow and a sparkly blue button. These elements really brought the card to life. There's a little gift card pocket on the front of the card, and I cut down part of the designer paper to make this cute tag to tuck inside. And a gift card would fit in there, too. The tag is topped with twisted hemp cord for even more of a nautical feel. Here's a look at the decorated interior of the card. I stamped the birthday sentiment onto grey cardstock. And because I love pockets, I had to make another one. 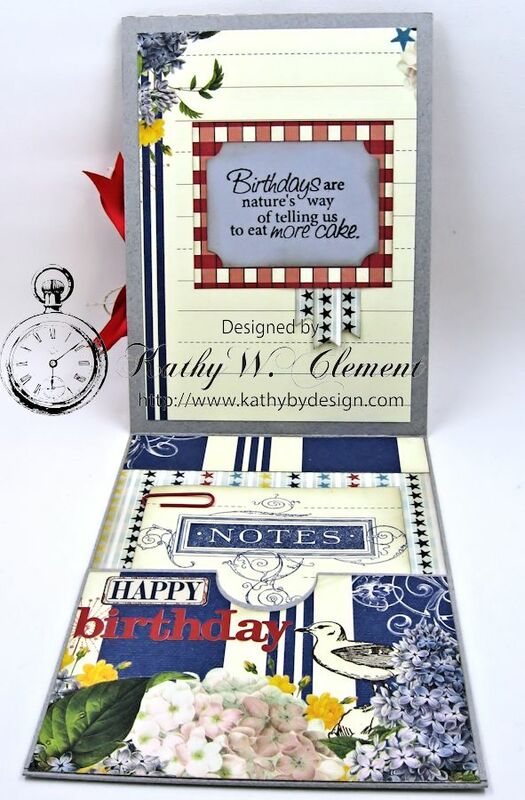 This one holds a little notecard that I created using designer paper from the collection. I left this blank so that the sender can add their own personal note here. This month's ribbon collection is so versatile. 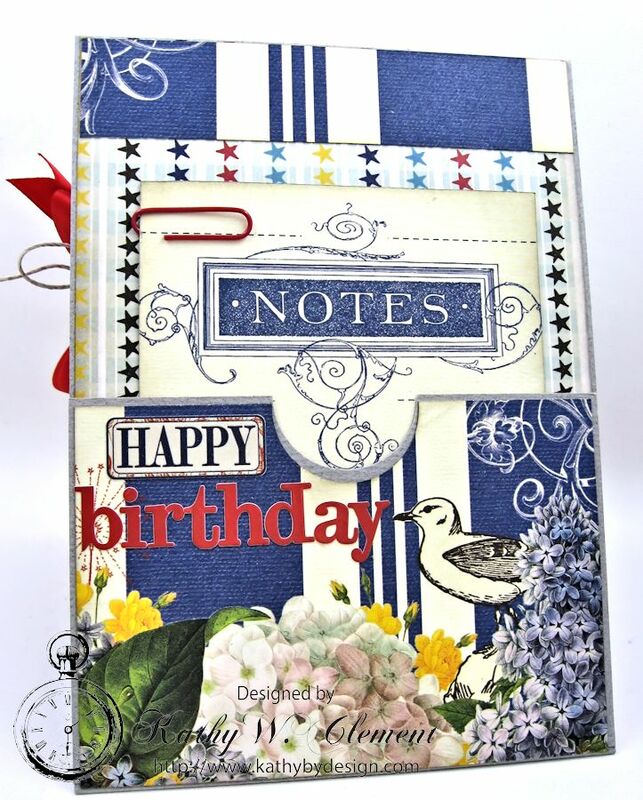 I've used it on a farm themed card, a true blue patriotic portfolio, and now on this nautical birthday card. 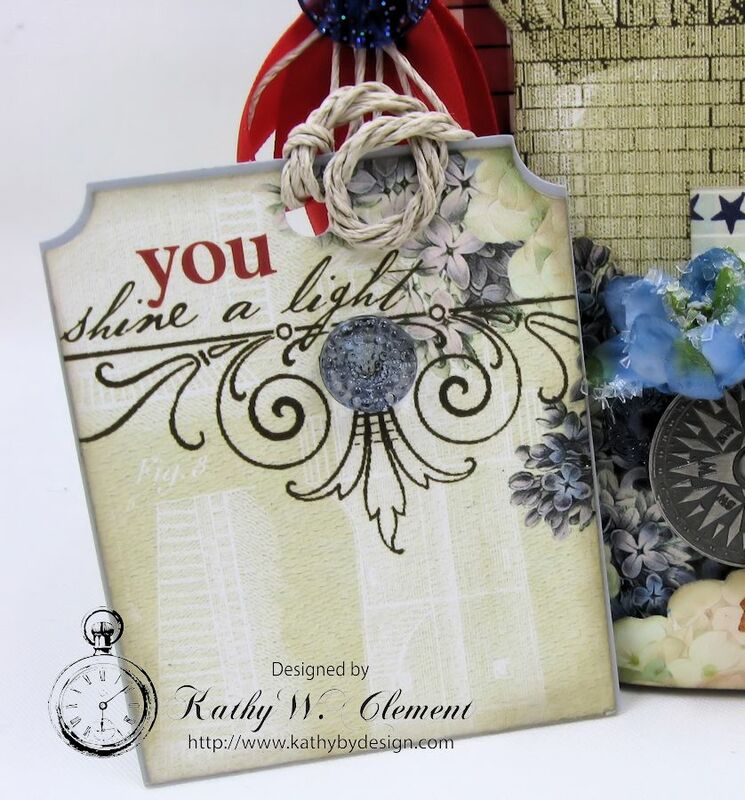 If you haven't signed up for the monthly ribbon club yet, I highly recommend it. It's always a treat to work with high quality ribbon! You can find all the details HERE. Thanks for stopping by, and I hope you all enjoy a safe and happy Memorial Day! RRR May Blog Hop Winner!